Jacko the Halloweener has declared it open season on frightful fits of fornication… So we’re putting together one HELL of a SPOOKTACULAR TREAT for Halloween! Get ready for the Class Comics Halloween Meaty! Jacko the Halloweener has decided to jump into the spotlight… again! As our official Halloween Ambassador, he’s decided to outdo Santa and spread his own mischievous version of Trick and Treating as far and wide as he possibly can! The Halloween Meaty is a bit different from the first two that we released. We’ve thrown the rules out the window and invited a TON of artists to take part in this particular spine-chilling event! While we haven’t heard back from everyone yet, we can tell you that it will feature works from over FIFTY ARTISTS. Yes, you did read that right! 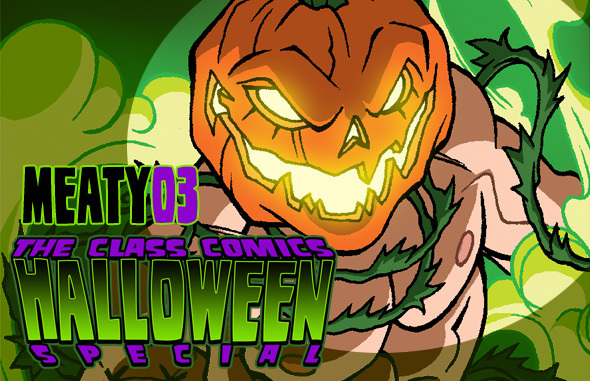 MEATY #3: The CLASS COMICS HALLOWEEN SPECIAL features the art of over 50 artists! Coming your way October 20th, 2012. It’s shaping up to be a tremendous collection of scary two page stories, character pin-ups, STRIPSHOW comics, Halloween-themed orgies, and tons and tons of other Tricks and Treats! Bob Grey: Not on the net… yet! Eric Mars:	Not on the net… yet! Jotto: Not on the net… yet! Norm: Not on the net… yet! Are you getting excited for Halloween? We certainly are! Or… is this posting just an evil trick? Nope — this TREAT is real and coming your way OCTOBER 20th! So count down the days! ← SATISFACTION GUARANTEED #3 now available in FULL COLOR!